A fully integrated marine, offshore and logistics services company based in Atlantic Canada. I. H. Mathers has a long history and wide range of experience in marine, offshore and logistics services. We have fully trained staff and facilities providing 24 hour, high quality and cost effective services to the marine, cargo and offshore industries. Our freight forwarding division and cargo handling facilities are staffed by a dedicated and knowledgeable team of freight and cargo management professionals. This highly skilled team handles more than 17,000 products a year, and has specialized expertise in managing unique freight and dangerous goods. We are leading experts in the offshore sector partnering with well-known international clientele. Our clients are drawn to I. H. Mathers for our experience, local regulatory knowledge, attention to detail and safety standards. We have the resources and expertise to help you succeed. I. H. Mathers is a significant player in the Atlantic Gateway. By the late 1800s, the port of Halifax was already a busy place with a forest of masts. Coastal and deep-sea ships travelled to and from a great variety of foreign ports. It was, as it is today, Canada’s premier east coast naval and commercial port with a fine sheltered deep-water harbour. Isaac H. Mathers wasted no time in joining the competitive ranks of Halifax’s marine sector. Competition between numerous shipping agents was very heavy, requiring a great deal of stamina and agility in order to get ahead. From the beginning, the Mathers firm took a leading position in developments. This was exemplified by a legal notice appearing in the Halifax Morning Chronicle on May 30, 1872. At this time, Mathers stationed a man on Citadel Hill to watch for inbound ships. When he saw one, the man would race down to the waterfront and row out to the incoming vessel in the hope of securing its agency. In many instances, he was successful. In those days, Maritime and Quebec lumber represented a huge export trade, particularly to Britain. Throughout much of the nineteenth century, it was common practice to build sailing vessels—particularly barques, brigantines and schooners—and load them up with lumber. Both the ship and cargo would then be sold to the highest bidder in a British port. Quite a few British ship owners got their start by putting Canadian east coast-built vessels into regular trade. Many of them traded with Canada for lumber and salt. By 1890, I. H. Mathers was exporting Nova Scotia lumber and canned lobster. The same year, Mathers was joined by his son Isaac Harry. The numbers seem insignificant today but in 1898, Mathers bought over 26,000 pounds of canned lobster at an average price of 20 cents per pound. The lobster was then exported overseas. In this period, Isaac H. Mathers also applied to become local consul for the kingdoms of Denmark, Sweden and Norway. His son Harry later became vice-consul for Czarist Russia in 1899. The office of Danish Consul is still in the Mathers family today. In 1906, Harry Mathers succeeded his father as president of the firm, which, by then, had further diversified into exporting wood pulp and salt fish, and importing molasses. To further their trade with the West Indies, Mathers built two sailing vessels, the first of which was the three-masted schooner HELEN MATHERS. They also became agents in Halifax for leading Scandinavian marine insurance firms. Throughout both world wars, I. H. Mathers was the agent for many ships that gathered in Halifax to carry cargo across the Atlantic. After the sudden death of Harry Mathers in 1945, two of his sons took over the organization. The eldest, Harry Isaac Mathers II, became president, with brother Evatt as senior vice-president. After World War II, the company bought eighty-four merchant marine freighters from the Canadian government for various clients. Some of the 10,000-ton vessels remained Canadian operated, but most became British registered. In the sixties, I. H. Mathers expanded its shipping agent business, dealing with a growing number of vessels, including tramp freighters and fishing fleets, container ships, and passenger liners. In the late 1960’s Mathers inaugurated a tugboat business for oil carriers in the Canso Strait area. During these years, Reliance Offshore was formed to act as a marine recruitment agency. It was during these years that they began providing crewing services for both Canadian and international offshore projects. Reliance Offshore’s primary function was placing qualified Canadian officers and seamen on the Balder fleet. It was also during this decade that Mathers acquired Atlantic Custom Brokers, allowing them to offer their clients a full trade service for their imports and exports. In the 90’s, I. H. Mathers continued to expand their service offerings by adding Mathers Freight to the family. Mathers Freight was established in order to provide clients with consolidation/ deconsolidation, container handling, inspection & documentation and warehousing services. There was also a push to expand Reliance Offshore’s ability to supply a wide range of offshore construction, exploration and production personnel, both locally and internationally. Throughout this decade, Mathers Freight established itself as a trusted and respected leader in offshore project logistics by providing services to every significant project on Canada’s east coast. In 2009, significant business growth led to the development of the new Mathers Freight 25,000 sq. ft. facility with over 200,000 sq. ft. of hard surfaced logistics and laydown yard. 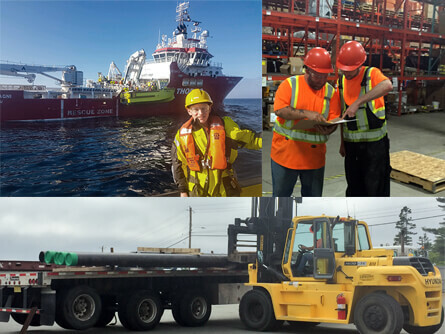 Although I. H. Mathers is still based in Atlantic Canada, it has grown into a fully integrated marine, offshore and logistics services provider. The organization is now able to provide a comprehensive range of marine, offshore and logistics services. In May 2018, I. H. Mathers amalgamated 3 of its divisions (Atlantic Custom Brokers/Mathers Freight/Mathers Logistics) into Mathers Logistics Ltd.
Mathers Logistics Ltd. will provide expert, cost effective marine agency, offshore logistics, cargo handling & warehousing, freight forwarding, customs brokerage and immigration services to domestic/international clients.